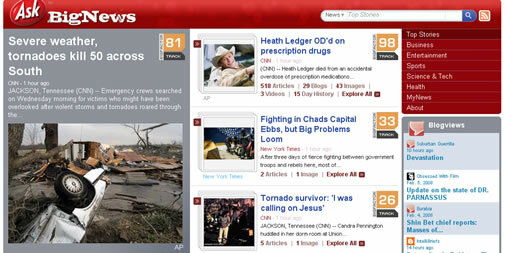 In the last few days we have seen rumors about Ask.com working with Digg to create a white label Digg like site. The project is “BigNews” and is not a Digg clone but rather a Google News/Techmeme like news tracker. BigNews presents the breaking news with a “BigFactor” (something like news score). News is arranged in 5 categories including Business, Entertainment, Sports, Science & Tech and Health. BigNews tracks stories from different news sources from all over the world and ranks them based on factors like, the freshness of the story, other articles linking to the story, associated media like images and video with the story and the discussion around the story. Top page shows stories from all the sections, but the individual categories show stories with BigFactor. I was rather surprised to see the result was not another social networking site, but I do however like the layout. While I have only browsed through “BigNews” for a few minutes, my initial thoughts is that this will be a nice news collaboration site. Yeah, I also think it has good potential. I wish they would explain more in detail how the algorithm works, mainly how Digg’s article ratings are factored in. Looks good. I think it has a good chance of growing.